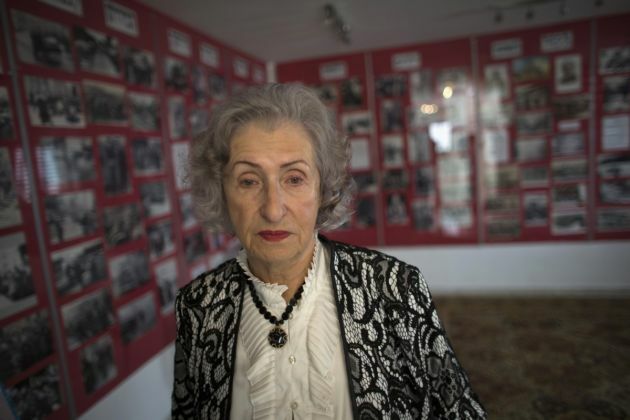 (Photo: REUTERS / Ronen Zvulun)Jewish Holocaust survivor Irena Wodzislawski stands in a museum commemorating the six million victims of the Nazi genocide, inside her home in the West Bank Jewish settlement of Ariel January 23, 2014. The private exhibit contains more than 1,000 documents, photographs, art work and other memorabilia, that she and her late husband, another survivor, collected from their native Poland and surrounding countries as part of their own private memorial to the World War Two slayings. Monday marks International Holocaust Remembrance Day. Picture taken January 23, 2014. Hungary has been embroiled in a standoff with the Jewish community about its Holocaust role and is facing accusations it is trying to whitewash its past in persecuting Jews. The accusations came ahead of the United Nations International Day of Commemoration of the Victims of the Holocaust for which the U.N. human rights chief issued a strong statement about the Nazi genocide. Holocaust historian Randolph Braham said he is returning a Hungarian State honor over what he called the government's falsification of Holocaust history, the Jewish Telegraphic Agency reported Sunday. At the same time the U.N. High Commissioner for Human Rights Navi Pillay said if people visited the former concentration camp of Auschwitz-Birkenau where part of the Holocaust was enacted they could learn about the terrible epoch of history. Braham said in a letter quoted by the Hungarian news agency MTI his action is a protest against attempts to whitewash Hungary's role in the Holocaust. Aged 91, Braham is a Holocaust survivor and he wrote that he was handing back the Cross of the Order of Merit "with a heavy heart" following recent developments in Hungary. Born in Bucharest, Romania, Braham is an expert on the Holocaust in Hungary and he said he will no longer permit the Budapest Holocaust Memorial Center to use his name for one of its research departments. He wrote "The Politics of Genocide: The Holocaust in Hungary," from 1981 and he received the Medium Cross of the Order of Merit of the Hungarian Republic in 2011. An emeritus professor at the City University of New York, Braham wrote in the letter, "The campaign of history falsification which aims to whitewash the (Miklos) Horthy era has shocked me." Horthy led Hungary into World War II as a Nazi ally. Braham said he was pushed by the decision of the government to erect a memorial in downtown Budapest to the 1944 German occupation of Hungary. It is he said, "a cowardly attempt to detract attention from the Horthy regime's involvement in the destruction of the Jews and to homogenize the Holocaust with the 'suffering' of the Hungarians" during the German occupation. Early last week the Federation of Hungarian Jewish Communities (Mazsihisz) threatened to boycott all events associated with the government's commemoration of the Holocaust taking place this year. Later in the week, Hungary's ambassador to the United Nations, Csaba Korosi, told MTI that he had apologized twice for the Holocaust on Thursday. The first time he said was at a press conference marking the 70th anniversary of the Jewish and Roma Holocaust and later at the opening of an exhibition organized by the Carl Lutz Foundation, the Tom Lantos Foundation, the American Hungarian Coalition and the Hungary Initiatives Foundation. "We owe an apology to the victims because the Hungarian state was guilty for the Holocaust. Firstly, because it failed to protect its citizens from destruction and secondly because it helped and provided financial resources to the mass murder," Korosi said at a press conference in the UN headquarters in New York. "Hungarian State institutions at the time [shared responsibility] for the Holocaust. This apology today by the Hungarian State must become part of national memory and identity," said Korosi. "Nobody has ever expressed the responsibility of the Hungarian State for [its role in] the Holocaust in this form and on behalf of the Hungarian state," Korosi told MTI. In a statement for the International Day of Commemoration in Memory of the Victims of the Holocaust on January 27, Pillay spoke of her visit to the "historic and terrible" place of Auschwitz. On January 27 each year, the day in 1945 the Soviet Army liberated the Nazi concentration and death camp at Auschwitz-Birkenau in Poland, the United Nations sets aside a day in remembrance of Holocaust victims. "Today, we honour the memory of the millions of people - men, women and children - brutally murdered seven decades ago for the simple fact of being Jewish, Roma, Slav or homosexual, because they had disabilities, or were Jehovah's witnesses or political opponents," said Pillay in a statement. "Around the world Holocaust survivors and world leaders speak out in remembrance of victims, but also to ensure the world never forgets what happened in Europe in the 1930s and in the 1940s," the former South African judge said. "I visited Auschwitz a few months ago, and I have a simple message for all those who deny that the Holocaust happened, or who engage in anti-Semitism or other forms of religious, racial or ethnic intolerance or discrimination: visit this historic and terrible place. "It is a truly humbling and harrowing experience to feel the chill of evil and immense tragedy that permeates its walls and grounds. It is important to feel - not just to know in an abstract way - where such behaviour can lead." She also lamented that in the decades since the end of World War II, and the revelation of the full horror of the Holocaust, "the flames of hatred and persecution have risen again to consume other countries" as she cited the killing fields of Cambodia, the forests of Srebrenica and the hills of Rwanda. She also said that in countries such as Syria, the Central African Republic and South Sudan, "people are still being maimed and slaughtered because of the group to which they belong."